Fortune Teller Video Slot Guide & Review - Casino Answers! 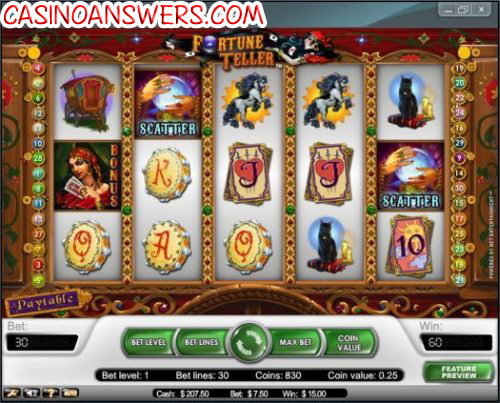 The Fortune Teller Slot Machine is a new slot machine launched by online casinos that use the Net Entertainment Software, like Tower Casino. We should also note, partly out of bragging, that when testing this slot machine out we had a huge slot win. Read on for more information on that. You can bet in increments of $0.01, $0.05, $0.10, $0.25, $0.50 and $1, so if you are looking for a great high roller slot this one easily accommodates you, as you can be betting up to $120 per spin. Of course if you are a fan of penny slots then this is also a great machine for you, as you can bet as little as one cent per spin. The Fortune Teller video slot also incorporates free spins, and a bonus round, as well as a wild symbol and a scatter symbol. The Fortune Teller bonus game features 5 tarot cards where you pick 1 and win the amount on the card, then 4 cards where you have to pick one, followed by 2 cards where you have to pick one. Each “round” has one death card which will end the bonus slot game prematurely. You need just 3 bonus symbols to start the bonus game. The Free spins feature is unlocked when you get 3 scatter symbols, and you will win 12 free spins. You can also win free spins during these free spins, and free spin wins are tripled. Fortune Teller slot also features autoplay, where you can choose to play up from 10 spins all the way up to 1000 automatically. You also have the option to stop depending on how your cash balance changes, on any win, if free spins are won, or if the bonus game is won. Test your luck today – try out the Fortune Teller slot at Tower Casino. Where can I play the Fortune Teller Video Slot? At any online casinos that utilize the Net Entertainment software. We recommend Tower Casino, as they are one of the only Net Entertainment Casinos to have their own downloadable client, and their loyalty program especially for slots players is amazing. Click here. Fortune Teller Slot Machine Strategy? What is the Fortune Teller Video Slot? What software has the Fortune Teller video slot? Does the Fortune Teller slot machine have a bonus game?